Address: Residencial Green Paradise. Paseo de las Acacias s/n. Metro Country Club. Juan Dolio, provincia de San Pedro de Macorís, República Dominicana, Juan Dolio (Gran Santo Domingo), Dominican Republic. 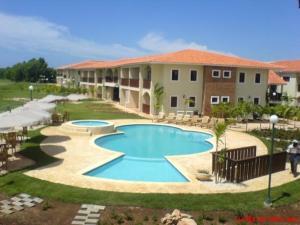 Located in Juan Dolio, Green Paradise offers an outdoor pool and spectacular views of the Caribbean Sea. This fully equipped apartment is just a 5-minute drive from Playa Juan Dolio beach. The apartment has 2 air-conditioned rooms and a private terrace overlooking the sea. It also has a seating area, a full kitchen and 2 spacious bathrooms, including one with a spa bath. At Green Paradise you will find a garden, while restaurants, bars and shops can be reached within a 15-minute drive. Free parking is available. Activities in the surrounding area include windsurfing, diving and snorkelling. Las Americas International Airport near Santo Domingo is a 30-minute drive away. Please note that the the prepayment deposit of 30% is required within the next 24 hours after booking to secure your reservation. The property will contact you after you book to provide any bank transfer instructions. Please note that check-in after 18:00 has an additional cost of USD 20. For stays of 1 week or more, a special discount applies to the price of internet. Please contact the property directly for further details. Please note that for stays of 1 month or more, electricity is not included in the price and will be calculated separately at the end of your stay. Please note that internet is available if requested at least 7 days prior to your arrival. Additional charges apply. Please inform Green Paradise in advance of your expected arrival time. You can use the Special Requests box when booking, or contact the property directly with the contact details provided in your confirmation. A security deposit of USD 600 is required upon arrival for incidentals. This deposit is fully refundable upon check-out and subject to a damage inspection of the accommodation.